October 3 2018. 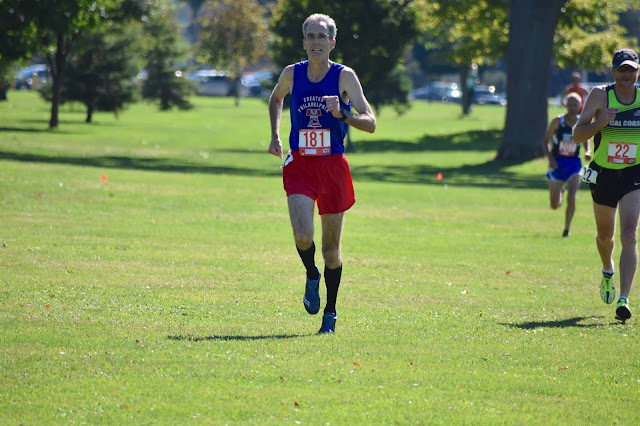 BUFFALO NEW YORK – This is the final recap I will post on the 2018 edition of the USATF Masters 5 Km Cross Country Championships. Some would say I have saved the best for last—the heart and soul of Cross Country is the team competition. I will cover it in the order of competition: Men 60+ and 70+; Men 50+; Women 40+, 50+, 60+, and 70+; and Men 40+. As noted in earlier reports the weather was close to perfect although slightly warm for XC especially for the last two races. Note: The low cumulative team score wins. For Women and Men 60+ and 70+, the lowest three scores are added. 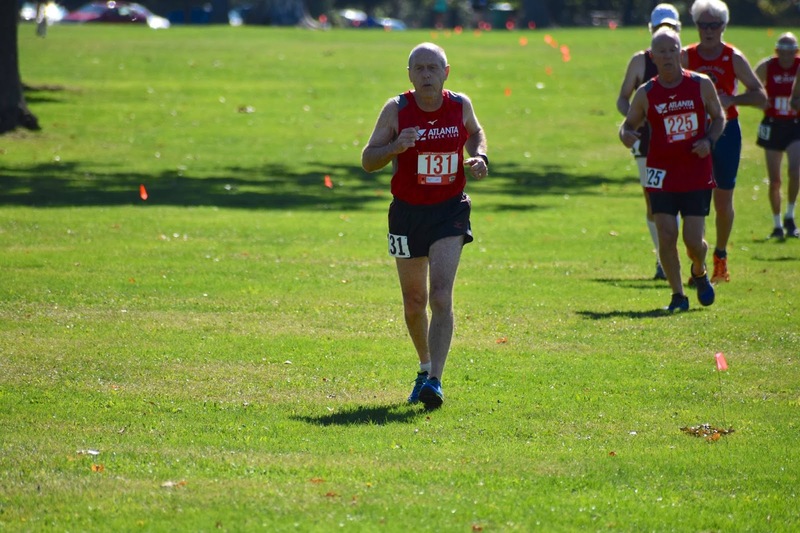 Men 40+ and Men 50+ use the standard XC scoring of lowest five places. Declared runners on all teams may displace runners on other teams. 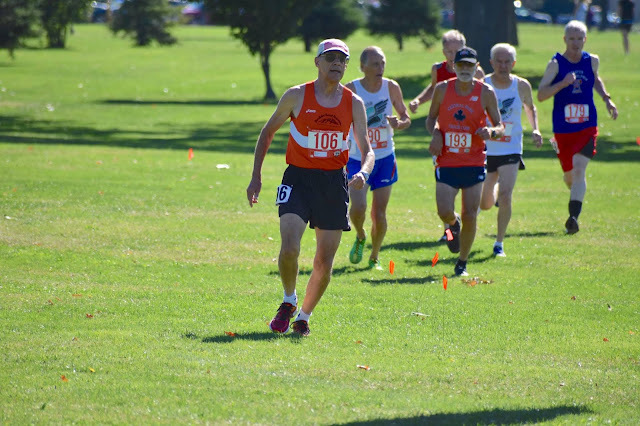 The Men’s 60+ races were pitched battles earlier in the year. Now that the Club Grand Prix title had been locked up by Atlanta, a little of the urgency had passed. Still it was a National Championship and bragging rights and prize money were on the line. Atlanta did not send a team. The Genesee Valley Harriers (GVH), out of the Greater Rochester NY area became the honorary ‘Home Team’ for this division. They were challenged by 5 Track Clubs: Cal Coast, Central Park, Greater Philadelphia (Philly or GPTC), Hartford, and the Shore Athletic Club. GVH knew they had a tight pack of 3 strong runners but no one who would necessarily land on the podium. Hartford, by contrast thought they had two front-runners who would need to be up front for them to take it all. Cal Coast was similar to Hartford in that they had a front-runner but would need their 2nd and 3rd runners to bring it home in the middle of the pack. Shore was similar to GVH but one of their top 3 was on antibiotics which might hamper effectiveness. Russell Blatt and George Buchanan sprinted to the front for Hartford and were never headed, coming in 1-2 twenty seconds ahead of the field. That gave them three points and counting but hey knew their third runner would not be in for a couple of minutes. Which teams would pack it in before then? Brian Nelson captured 3rd for Cal Coast which gave them hope. Then the home team came roaring in 11 seconds later with Tim Riccardi, Mark Rybinski, and Kevin Clinefelter claiming 4th, 5th, and 6th only 8 seconds apart. That gave GVH 15 points and the first team to get a complete score. If Hartford’s 3rd runner arrived at 11th place or better they had GVH beat! Cal Coast could no longer get the win but a podium spot would be nice. In the meantime Shore’s Kevin Dollard came across in 7th, with Philly’s Robert Reynolds in 8th. Then it was Steve Brumwell of Cal Coast and Shore’s Reno Stirrat. Cal Coast had two in with 12 points and Shore 2 in with 17 points. When Scott Linnell came home in 11th fifteen seconds ahead of Hartford’s John Matthews, that closed off scoring for Shoe at 28 and Hartford at 15. GVH and Hartford would have to go to the tie-breaker! Would Shore get 3rd or would that go to Cal Coast. It all came down to the ‘Chemo Kid’, Keith Witthauer who had just enough in the tank to finish in 15th giving Cal Coast 27 points and a 1-point margin over Shore! The first tie-breaker directs us to look at the final scoring finisher for each team, #3. Whichever team wins that contest is placed ahead of the other. In this case, the tight pack of GVH was rewarded with the win! The Atlanta Track Club and GVH had dominated the early races this year but Ann Arbor TC was coming on strong. Lloyd Hansen and Terry McCluskey aged up in late spring and late summer respectively, and the ageless wonder, the ‘Silver Bullet’, Doug Goodhue, had finally, after a couple of years battling injuries, recovered much of his former fitness. Ann Arbor had run off three straight wins and were gunning for a 4th. I, Paul Carlin, was also running for them but just as insurance, at least until I get my fitness back close to what it was last year. Atlanta’s Dave Glass and Jerry Learned are just behind Ann Arbor’s top bunch, but they do not have a third runner in that same niche. GVH, like their 60+ teammates, had a nice 1-2 punch earlier in the year with Tony Gingello and Jim May, and Keith Yeates not far behind. But Gingello is hampered by an injury now so Yeates has had to step up. The big new wrinkle for this race was the presence of the Greater Philadelphia TC. With Gene Dykes leading the way, they surely had the top finisher. But would he have a strong enough back-up crew to crush Ann Arbor’s hopes? As expected, Dykes took the win by almost a minute. But anyone watching the race could look back to see the blue on white of Ann Arbor prominent at the head of the field. McCluskey took 2nd and a half minute later, his old running partner, Goodhue, came across in 3rd, followed 16 seconds later by Hansen in 4th. Ann Arbor had a complete scoring trio and 9 points; that clinched the win. Even if Greater Philly got the next 2 spots, the lowest their point total could be was 12. But which team would take 2nd and who 3rd? Atlanta put in their bid next as Learned and Glass came across in 5th and 6th, giving Atlanta 2 scorers and 11 points. GVH was heard from next as May and Yeates zoomed across the line in 7th and 8th, giving GVH 15 points on two scorers. But Gingello, as noted, was not at this best. In any case, Thomas Jennings from Philly came across the line in 9th, giving them 10 points on two scorers. Now it came down to the third runners for Atlanta, GVH, and Philly and whether the 4th runners for Ann Arbor, me, and GVH, Liam Finnigan, would push them back differentially. Despite his difficulties, Gingello toughed it out and came home in 10th giving GVH 25 points and the lead for 2nd place. Now it depended on the other two teams. Finnigan and I did push them back but since Philly’s Fred Dedrick finished 14th and Atlanta’s Curtis Walker finished 15th, it made no difference between those two teams, it just pushed their scores up. GVH claimed third by one point over Atlanta. GVH needed one more runner in front of Philly’s Dedrick to claim 2nd, and that did not happen. This was a race where GVH could not claim the home team moniker as Checkers AC would be in contention and hails from Buffalo. 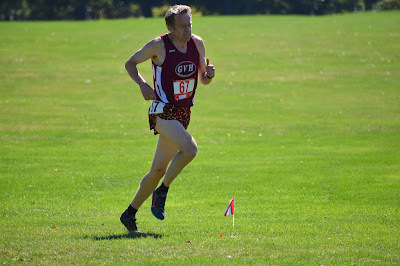 One of GVH’s top runners, Mike Nier, was nursing a hamstring strain so would not be at his best; others would need to up their game. The Central Park TC (CPTC) would challenge GVH for the win and it would be a battle between the Greater Philladelphia TC and Checkers for the final podium spot, with the possibility that Eastern Buckeye might be able to sneak in on Chuck Novak’s up-front prowess. Novak won the team competition as expected, followed a dozen seconds later by Philly’s Tim Harte and then Jim Park of Checkers, CPTC’s Brad Kelley, and GVH’s Alan Evans. All of these contenders had one runner in—who came next? 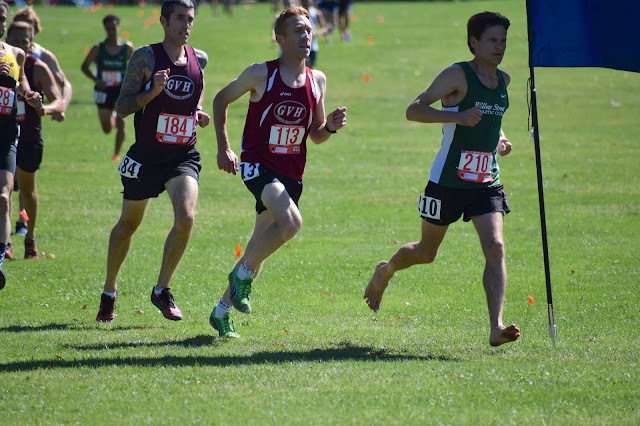 Ten seconds later two CPTC runners, Armando Oliveira, and Mark Lindrud, cracked across the line in 6th and 7th fifteen seconds apart and were followed a half minute later by their teammate, David Dorsey, in 8th. That put Central Park in the driver’s seat with 25 points on their 1st four runners. GVH kept their hopes alive when Adam Engst finished 3 seconds later in 9th, followed 6 seconds later by Theodor Schnauffer in 11th. That gave them 25 points on 3 runners; they would need their next two to come in before CPTC’s 5th scorer. But not on this day as CPTC’s David Greenberg came in just ahead of GVH’s Dale Flanders and Michael Gardella. That gave Central Park the win by 6 points. In the meantime, after Parks of Checkers came in 3rd, Philly packed it in with Daniel Mazo, Charles Shields III, and Keith Davies in 12th, 17th and 20th before the 2nd runner from Checkers arrived. That made Philly the favorite to take the last podium spot. 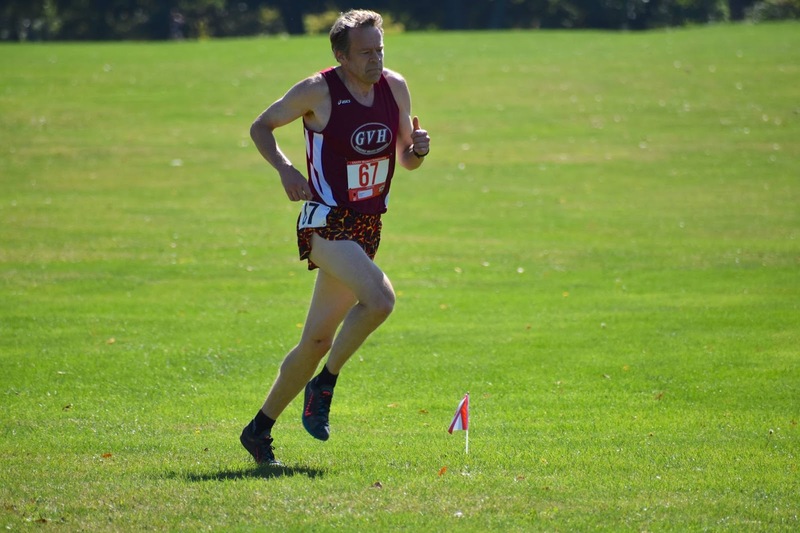 Then the pack from Checkers arrived, Sam Legierski, Paul Pulinski, Ronald Prabucki, and John McMahon taking 21st through 24th and closing out their scoring with 93 points. But Tom DeSchriver was only 3 seconds behind McMahon, closing out the scoring for Philly with a 25th place that gave them a 17 point margin over Checkers. Atlanta had a strong 1-2 in Sonja Friend-Uhl, who won this Masters 5 Km XC race overall in Tallahassee last year, and a newcomer to the Masters ranks, Jill Braley, but their 3rd runner was Kris Huff, stepping down from the 50+ team to help out. Would she be able to run strongly enough for Atlanta to outscore GVH, which had four strong 40-something runners? The Impala Racing Team from the Bay Area of San Francisco would also have something to say about the outcome. Like Atlanta, they were relying on a 50+ runner, Suzanne Cordes, to be one of their scoring trio but she had come in ahead of Huff in Atlanta at the 5K Championship and had only been a half minute behind the Impala’s likely top runner, Liz Gottlieb. Friend-Uhl and Braley led it off 1-2 as expected; then they had to wait to see how Huff fared. GVH roared next as Heather Webster finished 3rd, 20 seconds ahead of the Impala’s Gottlieb. A minute later Webster’s teammates, Heather Patterson, Caroline Bucci, and Murphee Hayes came in 5th, 6th, and 7th in a 14 second interval. That closed the scoring for GVH at 14. Huff needed to finish better than 11th to give the win to Atlanta. The Impalas could not beat GVH now and had only slim hopes of finishing 2nd. 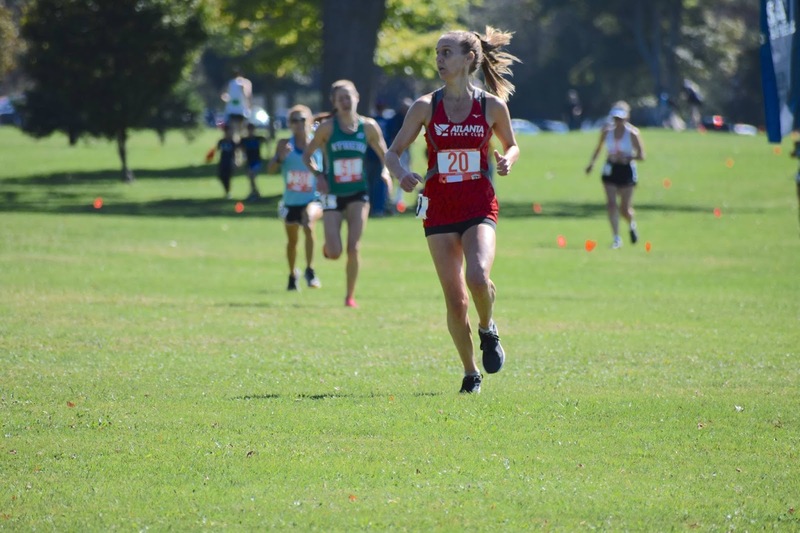 Alexandra Newman finished 8th for Impala, but only 2 seconds ahead of Huff, whose 9th place finish sealed the win for Atlanta. Cordes finished off the scoring for the Impala team. The Athena TC was looking to continue its string of wins; whenever they can field a complete team, they win this division. Atlanta, Checkers, GVH and the Syracuse TC were trying to end Athena’s string and, failing that, capture one of the two remaining podium spots. Marisa Sutera Strange did her usual fine job in bringing home the 1st place finish. After Amy Fakterowitz took 2nd for Checkers, Lorraine Jasper, back from the WMA Championships in Spain, took 3rd for Athena. Unless Athena’s Mary Swan was way back in the pack, things were looking good for them. Six seconds after Jasper finished, Syracuse’s 1st runner, Karyl Sargent came in 4th. 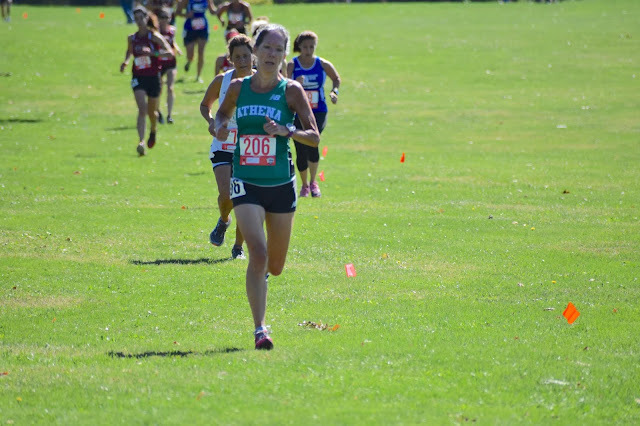 Mary Swan came across the finish line 22 seconds later, finishing 5th and wrapping it up for Athena. With 3 runners in and only 10 points, no other team could match them. Atlanta got on the board when Paula Johnson finished 6th but then Elizabeth Randell and Judy Arlington ended the scoring for Checkers with 7th and 8th, giving them a point total of 17 and 2nd place. Everyone else would be over 20 points. GVH had not been heard from yet so Atlanta and Syracuse both had hopes. 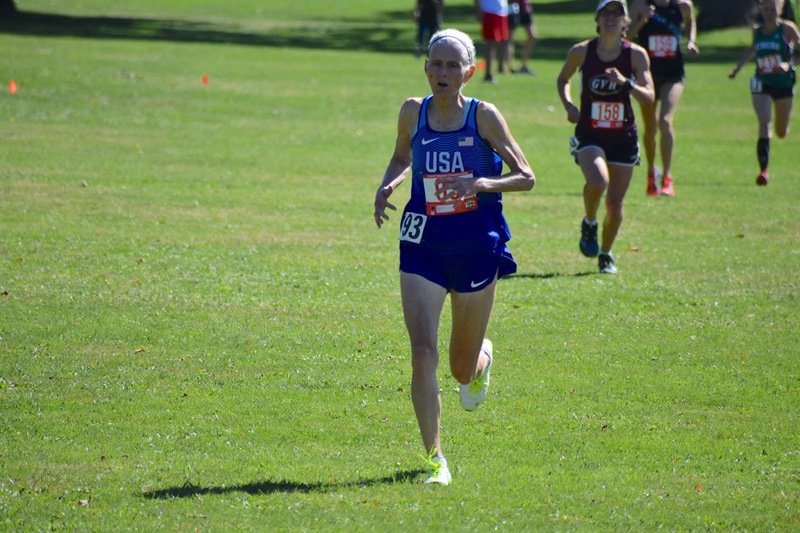 But the GVH pack was heard from next as Bonnie Lindblom and Maureen Bischoff finished with the same time in 10th and 11th. GVH was the first of the remaining teams to have 2 runners in. 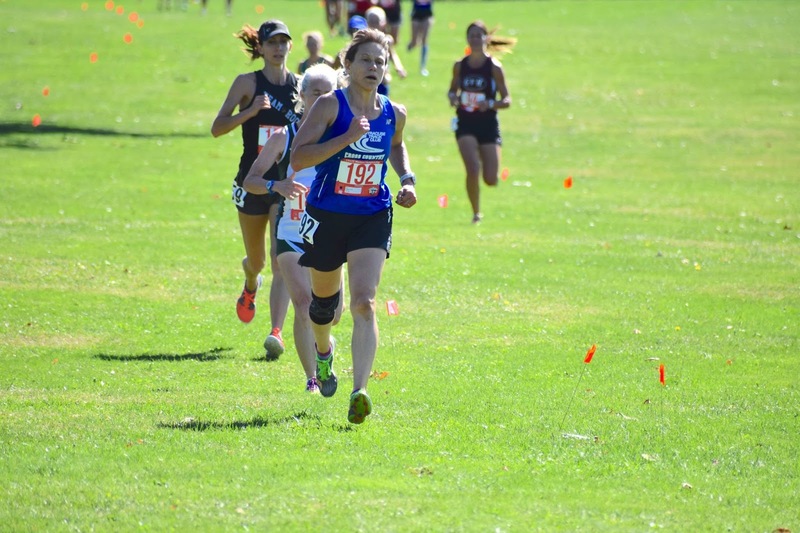 Mireille Silva kept Atlanta’s hopes alive when she finished 12th but GVH’s Beth Ann DeCiantis was only 9 seconds back in 13th. If Syracuse’s next two runners came in 14th and 15th, they could still get on the podium. But GVH’s Colleen Magnussen put an end to that possibility by finishing 14th. 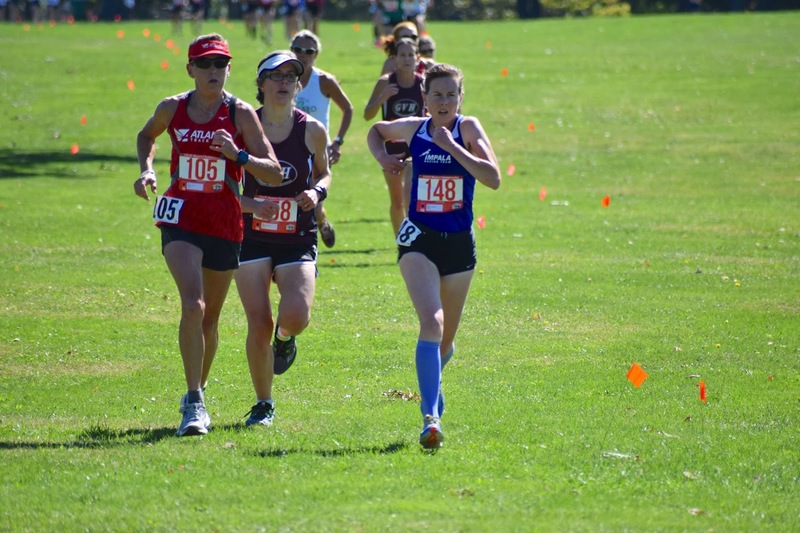 Patricia Ford and Sharon Ames came in 15th and 18th for Syracuse and Atlanta’s Robin Tanner finished 19th, giving both teams 37 points. The tie-breaker and 4th place went to Syracuse. GVH had this division all to themselves. Sharon Moore, Cheryl Guth, Cindy Ingalls, and Jeanne Herrick wasted no time in taking the win and the 100 points toward the Club Grand Prix Championship. Atlanta took this division unopposed with Leslie Brass, Catherine Radle, and Carol Rhodes enjoying the win. 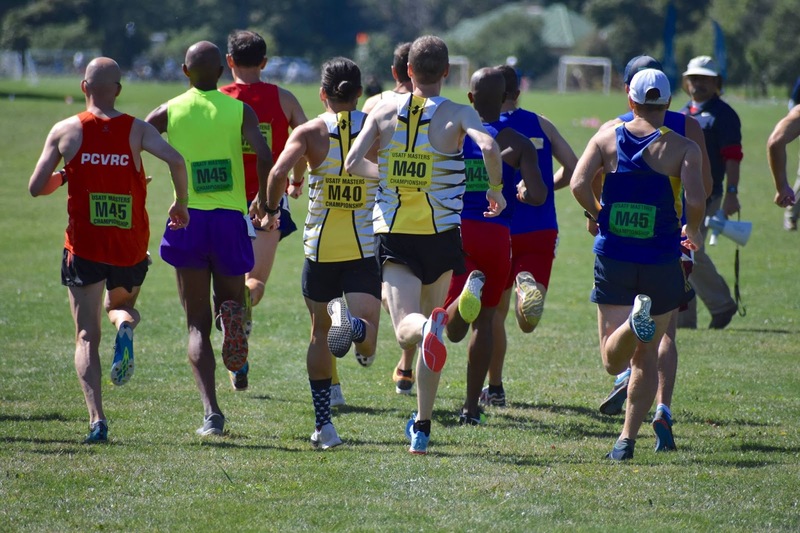 With the Club Grand Prix for this division wrapped up, the Garden State Track Club did not send a complete team. That left it to Checkers, GVH, Greater Philadelphia, and Willow Street AC (from the Albany NY area) to duke it out for the win. Jake Stookey, back on top of his game, took the win for Willow Street. But the next 7 places were all taken by either Checkers or GVH. Sixteen seconds after Stookey finished, Brian Lombardo put Checkers on the board with 2 points. Two seconds later, GVH was starting to cook when Kirt Komocki took 3rd. Tim Rieth and Josh Harter’s 4th and 6th for GVH was just enough better than the 5th and 7th places that Michael Selig and Kevin Burke claimed for Checkers to put GVH at 13 on 3 runners to Checkers’ 14 on 3 runners. When GVH’s Eric Sambolec took 8th four seconds behind Burke that gave GVH 21 with 4 runners and they could start to sense an imminent win. Willow Street was not done though as their Juan Martinez and Volcker Burkowski steamed across the line in 9th and 10th. When GVH’s Andrew Bucci finished in 11th 8 seconds later, that was it. GVH clinched the win with 32 points. The best possible score for Checkers was 34 points and Willow Street no better than 45. GVH had the win but could Checkers close out Willow Street? Robert Irwin took 12th for Willow Street, giving them 32 points on 4 runners. Checkers only had 14 points but their 4th runner was still out on the course. If Willow Street’s 5th runner could beat the 4th runner for Checkers, that could flip the table and put Willow Street into 2nd. 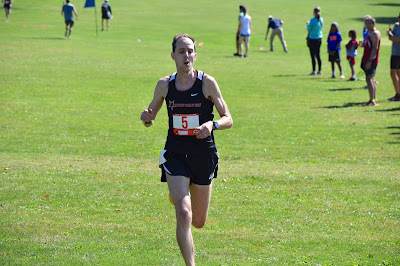 But after GVH’s 6th and 7th runners and a Philly runner came across, Matthew Dore, 4th runner for Checkers, claimed 16th. Willow Street’s John Stadtlander took the honors of the two #5’s but Checkers’ James Price was only 11 seconds back in 19th. That gave the Silver Medals to Checkers with 49 points and the Bronze to Willow Street with 50 points—How thrilling was that!? 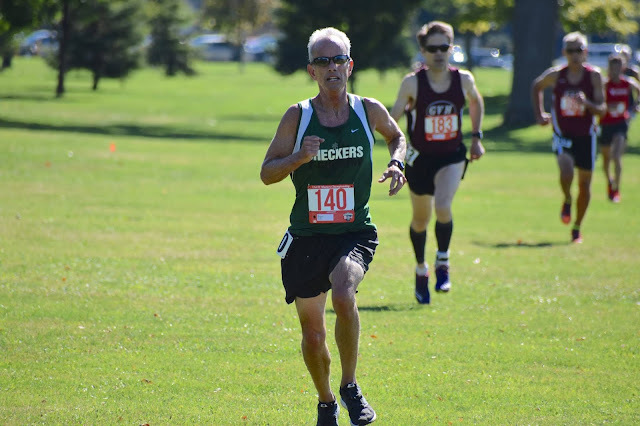 Age-Grading puts runners of all ages on the same footing by calculating a score that represents how fast the runner in question covered a given distance compared to the current statistically based projection of the fastest time for someone of their age. Tables are prepared separately for Women and Men based on data accumulated from all over the World by the Association of Road Race Statistics (ARRS), formerly headed by the late Ken Stone. Scores are in percentage terms but are not percentiles. Someone scoring 90% is well within the top 1% of runners of that age, not just the top 10% as a percentile would imply. The higher the percentage, the better the run. It should be noted that Age-Grading presumes a road race, not a cross country event. As Cross Country times are generally slower than Road times, so too age-grading percentages will be higher. One should be careful about treating Age-Grading percentages as absolutes across courses of different composition but even across road races with different elevation charts and, when comparing point-to-point courses with out-and-back courses. Age-Grading Awards were planned to give out three awards to men and 3 to women. 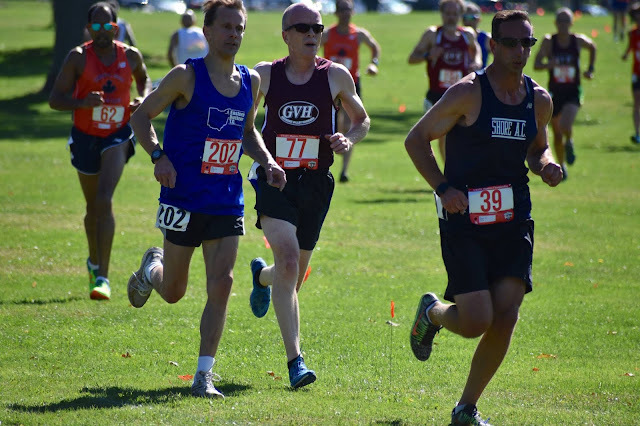 Because there were 3 separate Men’s Races, Men 40+, Men 50+, and Men 60+, the top runner in each race received the prize. The Women’s race combined all ages into a single race so it was appropriate to give awards to the top 3 women in the race, regardless of age. Everyone expected Sabra Harvey, 69, the USATF 2018 Masters Runner of the Year, to take 1st prize, even though she was just back from Malaga Spain and still jet-lagged. And they were right as she ran 21:47 and scored only 95.66%. I write ‘only’ because on the roads she will typically score around or even above 100%. Marisa Sutera Strange, 55, celebrated a return to normalcy by claiming the 2nd prize with a 20:01, age grading at 87.29%. 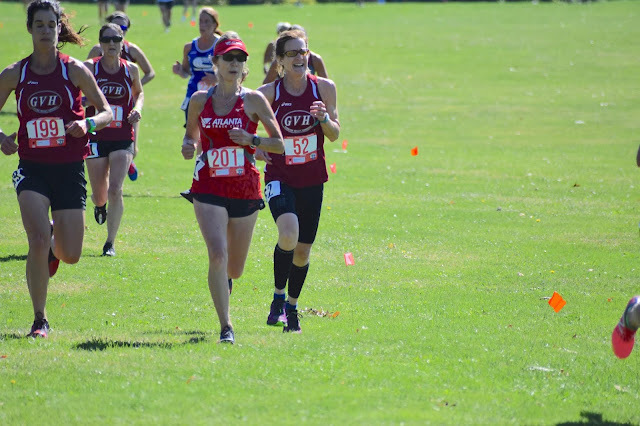 Katherine Wolski, 52, earned 3rd with her 19:49, meriting an 85.23%, allowing her to finish in front of Sonja Friend-Uhl and Lorraine Jasper in 4th and 5th. David Angell, 41, finished far enough ahead of his 45-49 rivals, Philippe Rolly and Jonathan Frieder, that he was able to add the age-grading prize to his division win and his Men 40+ Overall win. 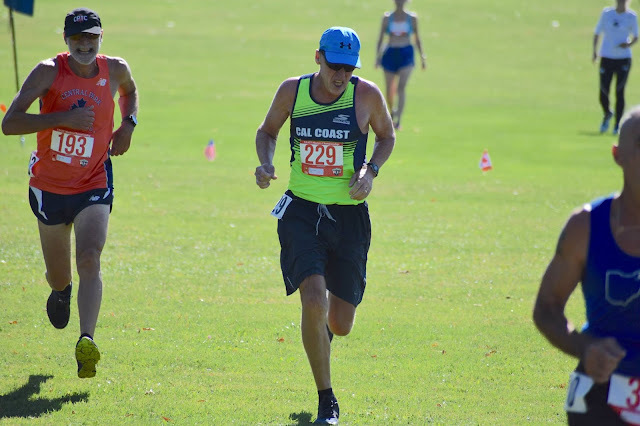 He clocked 16:29 to earn an age grade that was almost a full percentage point ahead of Rolly, with Frieder another point back. Alan Evans, 55, took the Age-Grading prize along with the Men’s 55-59 Individual Championship. 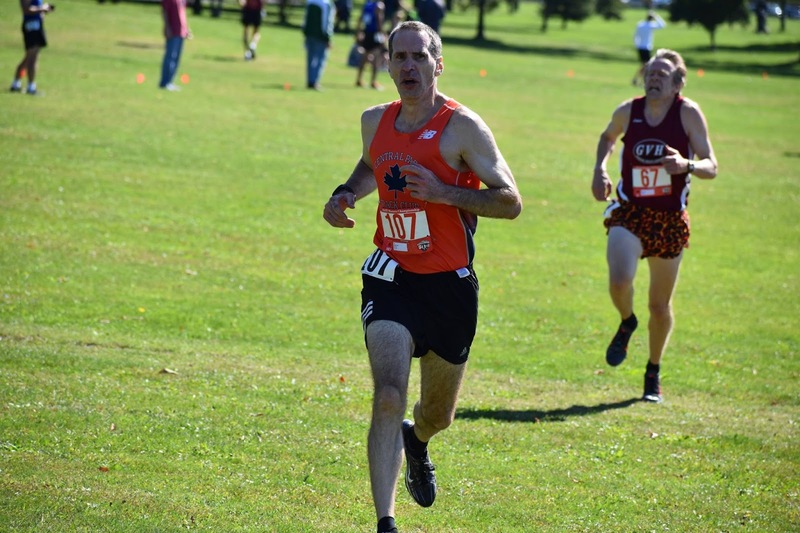 Tim Van Orden, 50, ran fast enough to win the Men 50+ race in 17:17 but Evans took the Age-Grading prize in a very tight contest by 0.08%. Doug Goodhue, the ‘Silver Bullet’ celebrated his first age-grading victory in a couple of years. It has been that long since he has been injury-free and fit. 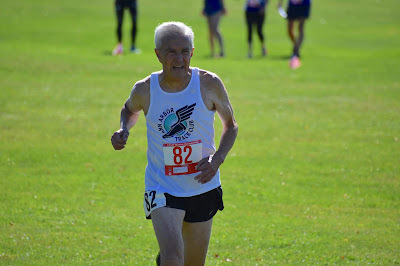 He returned with a roar at this Championship, taking 3rd place outright in the Men’s 70+ race at the age of 76! 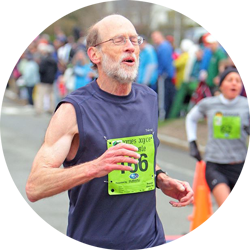 His 22:24 was good for an Age Grade a full percentage point higher than Gene Dykes, 70, who won the 70+ race in 20:49, and nearly 2 percentage points higher than Russell Blatt’s 19:20 which won the 60+ race. That's it for Buffalo--Next up Tulsa, the final event of the 2018 USATF Masters Grand Prix on October 27th. In this, its 6th consecutive year of hosting the Masters 15K Championship, Race Director Heath Aucoin has kept all of the welcoming characteristics, like the complimentary catered pasta dinner the night before the race, a barricaded, secure warm up area for Elite Open and Masters athletes, a 10 minute head start (up from 5 minutes!) and a great post-race festival party--Don't miss it!